* vintage and rare tarot – dig right in! Tarot Card #7 Chariot: A Pickle With That? “Witchy woman,” say the Eagles, “she got the moon in her eye.” Two of my most personal tarot cards are the High Priestess and the Moon. I always feel a very strong identity with both of them. But then, I’m not alone in that. Many tarot readers are female and both of these cards have strong feminine properties. “All that is now,” says Pink Floyd, “all that is gone, all that’s to come, and everything under the sun is in tune, but the sun is eclipsed by the moon.” The Magician that came before, and the Emperor and Heirophant that are to come, are Sun/Son powers. The High Priestess, however, derives her strange reflective power from the moon that lies at her feet and crowns her head. 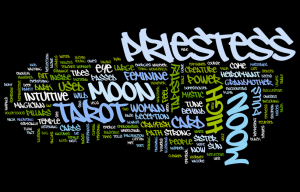 It is the rhythm of the moon that pulls the tides and pulls the woman’s monthly flow, so of course women feel somehow in tune with both the Priestess and the Moon cards in the tarot. The Fool encounters the High Priestess very early in his journey, having met only the Magician before her. In earlier tarot decks she was at times the Papess, a feminine version of the Heirophant, controversially said to derive from the legendary female Pope Joan. Wikipedia tells us many wonderful things about our Priestess, including that she is seated between the white and black pillars—marked ‘J’ and ‘B’ for Jachin and Boaz, whoever they are—of the mystic Temple of Solomon, with the tapestry of the Temple hanging behind her. It is embroidered with palm leaves and pomegranates, the pattern suggestive of her sister the Empress’ voluptuous gown, veiling whatever mysteries she guards. This tapestry behind the Priestess doesn’t quite hide from view a body of water large enough to be pulled and pushed by the moon tides. 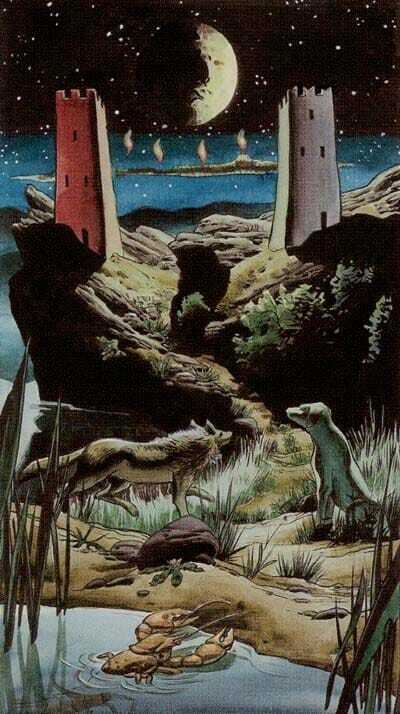 The tapestry has vanished in the Moon card, which pulls us from a large pool at the base of the card, up a path and through, in the distance, two towers reminiscent of the Priestess’ pillars. 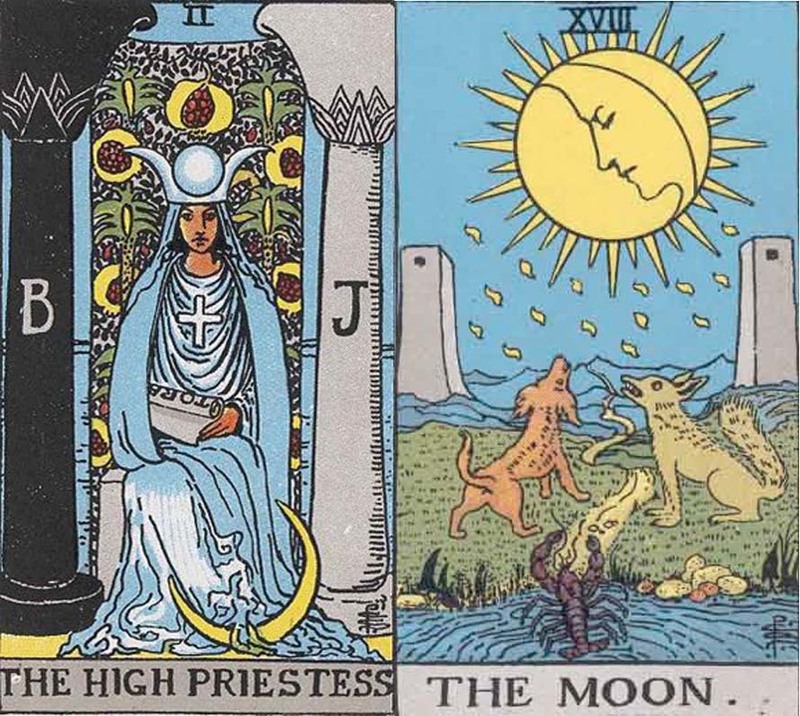 There are no people in the Moon card, a rarity in the tarot, but we find a number of mystic creatures entranced by the Moon: a crayfish, a domesticated dog and a wild wolf. The crayfish is for the unconscious, the other beasts for our dual natures. These animals represent the influence of an imagination run wild, of deception, and of illusion. Illusions and deception can be cleared away only by listening to the intuitive voice inside oneself, so that one’s true path can emerge. The High Priestess and The Moon teach the power of reflection. 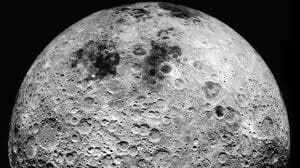 “‘There is no dark side of the moon really,'” someone croaks to Pink Floyd, “‘matter of fact it’s all dark. 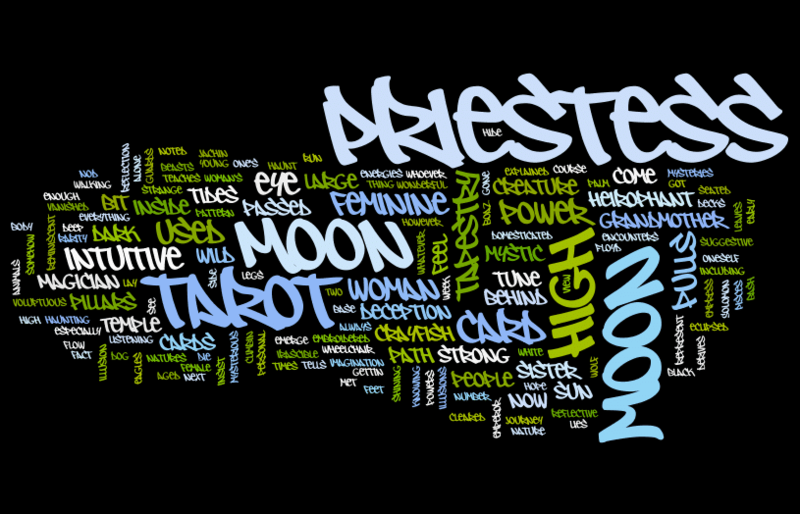 '” The High Priestess’ Moon power is mysterious and intuitive. Something passed down from grandmothers. My own grandmother used to insist I inherited her psychic abilities, both of us being Pisces. All I know is, for a week after she died (at age 103) I felt her very palpably around me, though as a young woman not as her aged demented self. My sister says she was haunting me, and knowing her irascible nature she probably was. She used to bash at her nurses’ legs with her walking stick as they passed by her wheelchair. I hope to do the same thing at 103. Die and haunt people, I mean. “But now it’s gettin’ late and the moon is climbin’ high,” says Neil Young, “I want to celebrate, see it shinin’ in your eye.” Neither the High Priestess nor the Moon tarot cards can be adequately explained, but their intuitive energies can be noted, used and celebrated. Every creature, especially every feminine creature, has a bit of the witchy woman deep inside, a bit of the moon shining in the eye. My grandmother would lay her finger next to her nose, and nod wisely in agreement. 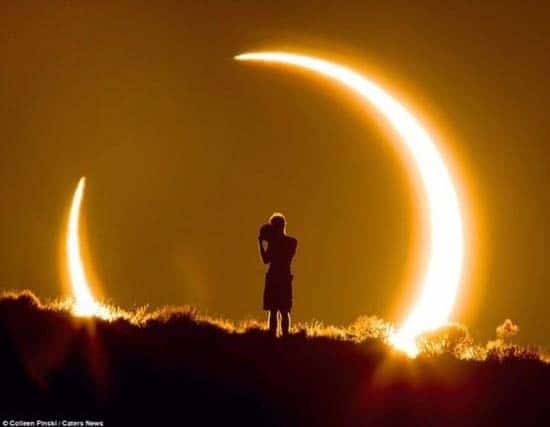 Solar eclipse photo by Colleen Pinski. 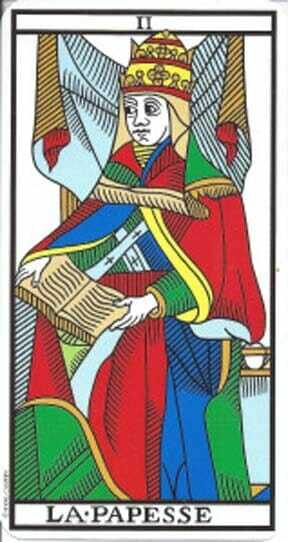 The first La Papesse is from the Marseille Tarot. 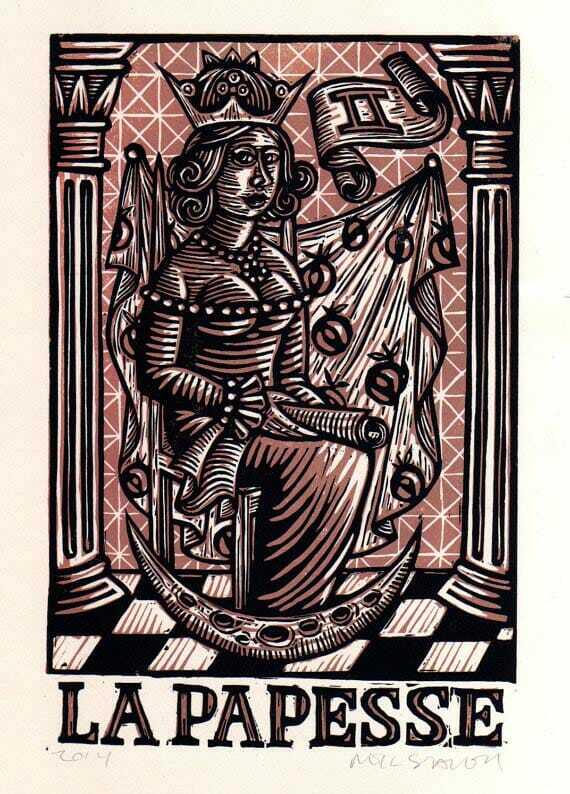 The second La Papesse is a woodcut by Neil Stavely. The Moon card is from the Initiatory Golden Dawn deck. The dark moon wallpaper is unattributed. 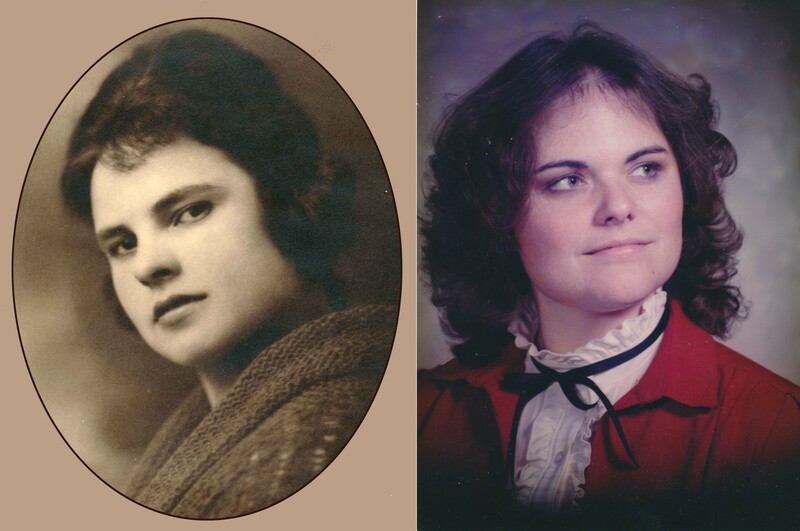 The photos are of my grandmother at age 18 and me at age 30.